Mission: To deliver timely, accurate and informative Philly sports news and information to the best fans in the world, while adding our touch of humor, wit, extensive knowledge and multimedia coverage. Phillie Phanatics, which is now High Hopes was established in December 2008, on the heels of the city’s first World Championship in 25 years. Since that time, the names Shay Roddy (Founder and Managing Editor) and High Hopes have become synonymous with Philly sports. High Hopes prides itself on being the place to go for Philly sports news and information, and things won’t be changing anytime soon. 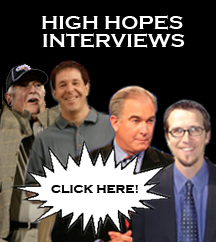 After revamping to include an all sports format back in November 2009, High Hopes has constantly made key additions to its lineup of writers, bringing in professionals from across the local industry. In addition to Shay, Homer Plate, a former Hollywood script writer, Pennsylvania Golfer humor columnist and successful freelance humor writer, has been added to share his brand, which is unlike any other, of Philly sports. His column, Out of Left Field has drawn praise from readers worldwide. Phil Andrews, the 20 year Philadelphia TV vet is sharing his inside access and unique brand of reporting to form several weekly pieces for High Hopes. His contributions began the formation to a multi-media format, which makes High Hopes a unique place to go for writing, audio podcasts and video reports from the spot of the night’s big game. We live in the greatest sports city in America. Just watching the games isn’t enough, so be sure to drop by High Hopes to keep up to date and in-tune on all things Philly sports. -Ray Didinger, Pro Football Hall of Fame sportswriter, Four-time Emmy Award Winner, best selling author. To view a complete list of our team and their contact information, click here. 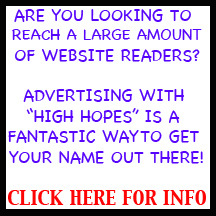 To learn more about advertising rates and other opportunities, click here. Homer, maybe now you can pay off your 3 year old bet for dinner that Mcnabb would win the Super Bowl. Everyone at Vesuvio Restaurant loves your blog. Everything and anything Philadelphia sports related really peaks our interest. We even created a “Players Show” revolving around our Eagles. Every Monday during football season we have an Eagles player pick their favorite childhood dish and we recreate it at the restaurant. The recreated dish will be on our menu for the week and all proceeds from it will go to the Eagle player’s selected charity. Before the player chows down on his meal, Reuben Frank and Marc Farzetta will have a question and answer show for customers at Vesuvio. We would love for you to come by to one of our Players Show or any day for that matter and let us know what you think! Also if you ever need or want content revolving around food and the Eagles let us know, we would be more than happy to help. Thanks for listening, once again, love the blog! GO EAGLES! Great read. I am putting you on my list of must reads for Philly Sports!